The ÔM pendant can be used simply as an accessory but its real power resides in its use for meditation. Using it for meditation is extremely simple and explaining the process doesn't warrant more than a small paragraph, so if that's all you want to know you can jump to the bottom of this article. On the other hand, if you are like me and enjoy learning the deeper story behind everything, then join me along this journey to the roots my dear friend. The ancient ÔM symbol displayed on our pendant represents the sound of the universe and is considered the matrix of all sounds. It's the ancient Indian equivalent of the "big bang" concept. As with many of the philosophical contributions made by these wise ancient Indian philosophers, in a few years Western science will probably discover that the Big Bang was actually more like a "Big ÔM". The scripture in this symbol has yet to be identified definitively, but it is evidently pre-Sanskrit (see the marking differences between the rectilinear character style of Sanskrit and the curvilinear character style of the ÔM symbol) and pre-Hinduism (after all, Hinduism derived from the encounter between the Aryan and Dravidian cultures roughly 3,000 years ago), and deriving from highly educated and sophisticated ancient cultures that have since been mostly erased from the collective historical memory. At this point, it may be impossible to make a definitive link, but most of the evidence shows it is likely of Dravidian origin, or perhaps older. The Dravidian civilization populated much of modern-day India & Pakistan 5000+ years ago. The Indus Valley Civilization is a well-known example of a commercially successful, culturally sophisticated and scientifically advanced Dravidian society. Much of what you'll learn about the ÔM in books, online or with teachers has suffered the influence of mystical misinterpretation and religious appropriation that occurred during the decline of the Dravidian civilization. Before explaining how to use the ÔM, let's look at a couple more common misunderstandings I didn't mention in the earlier post about the story of our pendant. It's interesting to consider that the mistakes I commonly see in New York and online are most likely made unknowingly. Let's take a gander at the circumflex accent we use when writing in Latin characters. Understanding the purpose of the accent will help you avoid two major gaffes. So what's the deal with the accent on the "O" that looks like a little hat? Our use of the circumflex accent “Ô” (yes, I really did call it a "little hat") represents a diphthong of “AU”, which is the blending of two different vowels. The difference between ÔM and AUM is simply one of transliteration. It's ideal to avoid writing AUM because anyone who learns from books or a poorly informed teacher is more prone to errors in pronunciation and completely changing its effects. On the other hand, if ÔM were to be written OM (as, in fact, it usually is), without the circumflex accent, it would be a poor transliteration from Sanskrit to Latin characters because OM could not be accurately returned (re-transliterated) to Sanskrit characters. The quality of a transliteration can be determined by the ability of a layman to return to the original alphabet without modifications. While there is a way of writing ÔM in the dêvanágarí alphabet, i.e. the rectilinear form, the curvilinear form that is adopted in Yôga and in other philosophies is much more ancient and probably has its origins in pre-Aryan cultures. 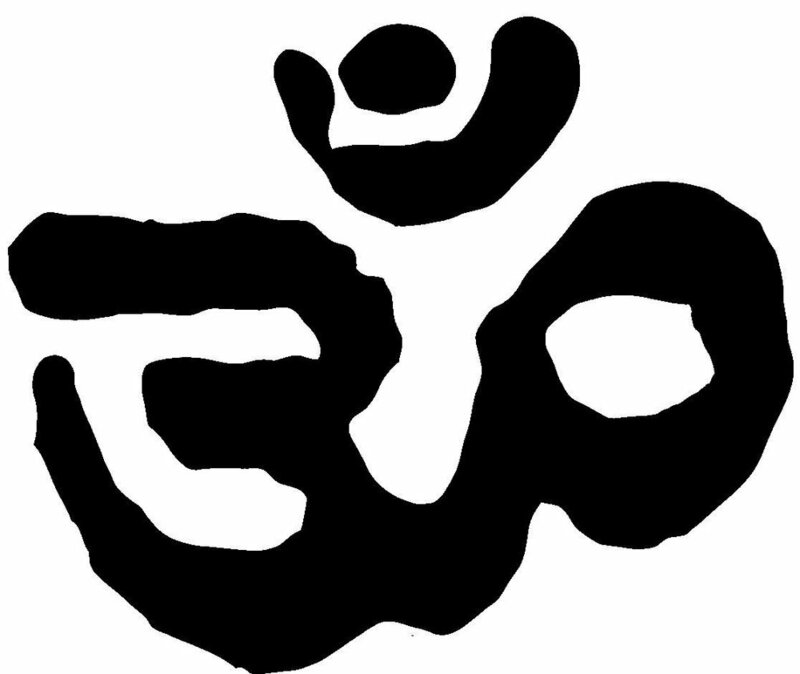 When the ÔM symbol is written, it is referred to as Ômkára, and when pronounced it is referred to as Pránava. All schools of Yôga (Yôga is any strictly practical methodology that leads to samádhi) adopt the Ômkára, which is the drawing of the syllable ÔM. There is an ideal form of writing it and an infinity of stylizations based on the calligraphy of each school’s founder. Therefore, the symbol is the same, but not identical, since each school adopts a specific design that establishes a connection in the collective unconscious with the force of the lineage's Ancestors. There are several correct and powerful ways of pronouncing the pránava. Seven forms of pránava are taught in our school, each with a unique effect (limited copies remaining of our CD containing all seven). When using our ÔM pendant you establish a connection with ancient current of force, power and energy that is one of the largest, oldest and most powerful on earth. Many people associate the use of a ÔM pendant with protection, and while we do recognize a certain class of effects in this order, we don't think it should be the justification for using the ÔM pendant. It should be used in a casual and genuine way, as the average person does when wearing the symbol or logo of their favorite club, team or university; use the ÔM pendant if you identify with what it means and the lineage it represents, not for superstitious reasons or for its benefits. We adopt a design of the yantra ÔM reproduced photographically from an ancient text found in Rishikesh, India, in the Himalayas. The meticulous detail of the yantra ÔM should not be changed in any way. Utilize the illustration below to practice concentration and the first level of meditation (yantra dhyána). Look at the symbol for as long as necessary until you can preserve the image in your mind with the eyes closed. Text extracted from the book Treatise of Yôga by DeRose and translated by John Conway Chisenhall. Once I dreamed my Mentor offered me an object loaded with the power of the Ancient Teachers, it materialized amid a swirl of golden light in his palm, right before my eyes. When the luminous fog dispersed I could see it was an extremely beautiful medallion with the appearance of an antiquity aged by time, carrying a magnificence and dignity so evident that it leaped to the eye. In the center, I recognized the ÔM, the universal symbol of Yôga in Sanskrit, written in the Devanagari alphabet. It was just a dream, without any pretension of being a precognition. But, it was a clear and strong dream that I remembered vividly for a long time. The years passed by and I traveled to India often for twenty years. During one of my trips to the Himalayas, I attended a very prestigious monastery, where I participated in diverse modalities of Yôga. There was a library with some very old, rare and precious works. I was rummaging through one of the books when I found an ÔM with a design that fascinated me. It was aesthetically superior to those that typically appear in most of the Yôga books. It had an impressive harmony and equilibrium. I let myself travel within its lineage of power and entered into deep meditation as I contemplated it. After the experience, I was enraptured by this incredibly strong symbol. I couldn’t resist a photograph. When I arrived in Brazil, I sent the ÔM to be photolithographed and expanded. The result was surprisingly good. The small irregularities of the ancient form were well pronounced on the rustic paper. The outline of the Ômkára acquired an even more ancient and weathered appearance. It was so beautiful that my students and the other instructors, everyone, wanted a copy. Some of the students began to make gold medallions trying to mimic this noble ÔM but evidently the goldsmiths had difficulty recreating it because frequently they made serious errors in the layout or in the proportions. These imperfections were imperceptible to the layman, nevertheless, significant enough to be capable of changing its characteristics. a) usually, the jewelers that recreate the ÔM don't understand anything about the symbol they are trying to reproduce and end up committing serious blunders, often creating designs with poor taste, thus losing the original character and nullifying its positive effects. b) otherwise, because gold is an expensive metal, the jewelers would make inadmissible cost-saving measures. When worn, it is common for the pendant to turn around, showing the inverted image of the ÔM, giving an observer the antithesis perspective of the yantra ÔM! Since the power of symbols is transmitted by the codified archetypes of the unconscious in deep areas of the human mind, this flipped perspective of the ÔM generated the opposite of the expected effect. I don't know if it is mere coincidence, but most of the people who used this ÔM, that flipped around and stayed inverted, ended up showing signs of dissonance. This is why I decided it was more prudent to assume the responsibility of having the pendants coined with the powerful ÔM that I brought back from the Himalayas, just as I had dreamed about years earlier and made with the same metal alloys that are often used in Indian handicrafts, brass (copper and zinc), sterling silver and gold. So, I had a pendant coined in its ancient format, with the ÔM on one side surrounded by Sanskrit inscriptions and the ashtánga yantra, the symbol of SwáSthya Yôga, on the other side. When the first pendant was made it moved everyone with its exceptional beauty, harmony, sensibility and strength. It was a work of art. Never before had I seen a pendant with such a beautiful ÔM anywhere in the world, not even in India. Even in India, people asked us where we got such an authentic remarkably stamped pendant. Thanks to this medallion, DeROSE Method practitioners and friends are always finding each other, expanding their network of friendships around the world in airports, trains, buses, theaters, etc. Subscribe to make sure you don't miss our next post going into more detail about how to properly use this powerful ÔM pendant... stay tuned!